The past I’ve emerged from is … pitted by gaps left by silences stretched across generations. By losses of language and voice. By human displacements. By immeasurable dimensions of lives compressed and deflated. And by dismembering narratives of who ‘we’ are to each other in this land. The plates provide two dates: date of deportation and date of murder. Two summers ago, I spent six days in Berlin with my daughters. We rented a fifth floor walk-up in the bustling Mitte neighborhood. Our landlords were Italian. I don’t know how long they’d made their home in Berlin, but they appeared settled; they owned a shop two blocks from our flat. Cattycorner from the flat was a café that sold delicate, flaky pastries and luxuriant coffee. It was frequented by locals who arrived on bicycles—toddlers and school-aged children in tow—and by European tourists in search of espresso. Today’s Berlin is an international hub with a polyglot population that prides itself on tolerance and inclusiveness. With the knowledge that it was not always so, the city is awash in museums and monuments struggling to tell the troubled history of its lost citizens. 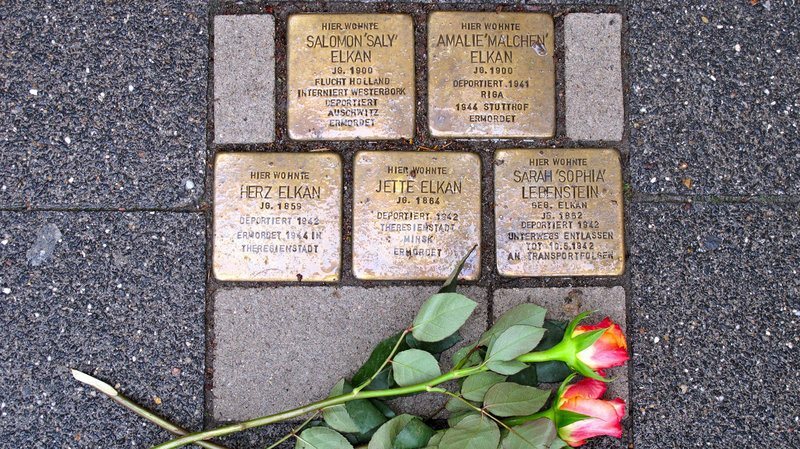 In various parts of the city, brass plates embedded in the sidewalk mark where Jewish families lived. For these tens of thousands, Berlin was home. Until it wasn’t. You could walk by the sidewalk plates and not notice them, or you could pause to consider those ordinary Berliners living humdrum lives—frying potatoes and tucking in their children, planting flowers in the window boxes and doing the ironing, reading the paper in the living room easy chair. The plates provide two dates: date of deportation and date of murder. Other such markers are affixed to the sides of buildings like misplaced home addresses. The Nazis were excellent record keepers. We spent a day at the Berlin wall, scrawled with art accreted over decades; symbolism of an oppression fresh in memory. “Let’s build a wall,” the authorities said, erecting a concrete barrier that rendered home part of a contrived ‘east’ or a coveted ‘west.’ The wall separated families and lovers, and isolated a regime whose most productive output was an intricate web of at-home spymasters—neighbor against neighbor, children betraying parents. On one side of the wall lay freedom (and rampant capitalism), on the other, rows of tall, blocky buildings, unencumbered by trees, and therefore by shade. Today those apartment blocks house thousands, many of whom have fled their places of birth. They are immigrants and they live far from home. We discovered a photography exhibit behind the wall that displayed annotated portraits of Syrians. Boys with stumps for legs dished for the camera. Girls recounted how they went about searching for food for their baby brothers. The subtext for each picture was a family’s specific decline into hell. The children—missing limbs or eyes—spoke in the language of hope to describe their ambitions to return to school; to find their parents; to have an opportunity to live, once again, in normalcy. Anything, to find home. I wondered how to teach new generations about the scale and scope of the crime. We visited the Topography of Terror at the site of the Nazi Secret State Police Office, the leadership of the SS, and the Reich Security Main Office. There, a series of outdoor panels enumerates how the German government carried out its populist agenda. In thrall to relentless propaganda about Aryan supremacy (make Germany Aryan again) laced with racist lies, an entire nation not only stood by, but largely assisted as their Jewish, and homosexual, and communist, and Roma neighbors were stripped of their rights; denied the ability to own and run businesses (indeed, to earn a living); robbed of their property; and finally, murdered. Even though these unlucky Germans—many of whom served their country in World War I—had never questioned their German identity, for them, home meant death. Methods of slaughter varied according to where home happened to be: machine guns poised over mass graves in Lithuania, a ghetto under siege in Warsaw, humans burnt alive in locked buildings, death by shot gun and Zyklon B and forced marches and starvation across Europe. National boundaries proved inadequate to prevent the transformation of home to killing field. In silence, the Memorial to the Murdered Jews of Europe has a moving severity. The day we visited, children were gleefully playing hide and seek amidst the stones. Young people picnicked on top of them. At what point and at what distance from the events, is the appropriate time to play on such a memorial? When will all those people’s homes be forgotten? Perhaps that time has already come and gone. On December 19, 2016, Anis Amri, a man of Tunisian origin, crashed a truck through a Christmas market beside this church, killing twelve people and injuring dozens. He was shot by police in Milan a few days later. After visiting the Kaiser Wilhelm Church we headed to our apartment in the late afternoon heat. On the way to the train station, we passed huge department stores, many of them the upscale chains now found in any city in advanced industrial countries. There was no sense that people lived in this West Berlin neighborhood, or in fact that they ever had. There was, instead, a sense of consumerism unleashed, the streets empty only because the stores were closed for the day. 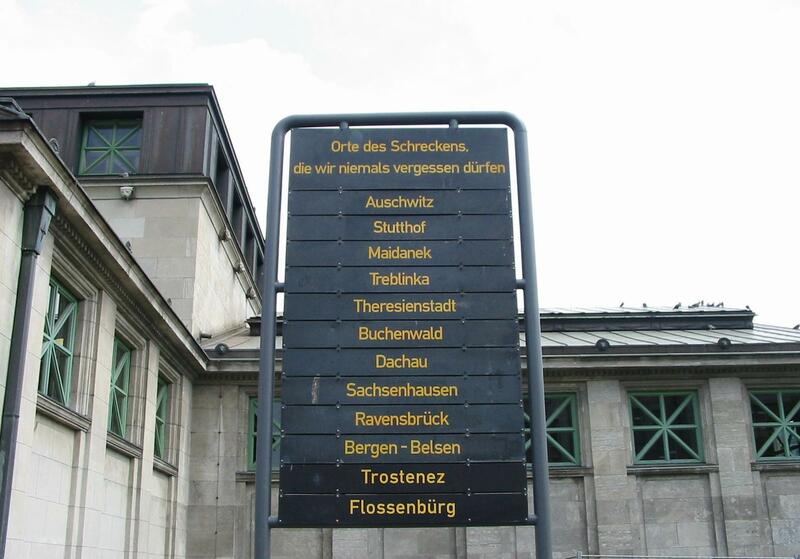 Outside the Wittenbergplatz U-Bahn stop was a large sign, a reminder of the previous destinations for Germans assembled here: Auschwitz, Stutthof, Maidanek, Treblinka, Theresienstadt, Buchenwald, Dachau, Sachsenhausen, Ravensbrück, Bergen-Belsen, Trostenez, Flossenbürg. Urdu is the language of poetry. Inside, the station looked as it had in the 1930s. I tried to imagine it filled with people, clutching suitcases that they would never need, leaving their homes—forever—uprooted by a once democratically elected regime that used words and laws to ensure to dispatch them to their deaths. One half of my family is German. My grandmother was born to German immigrants in New York, and my grandfather emigrated to this country from Germany at age sixteen. His brother-in-law, brother-in-law’s second wife (the first wife—his sister—died in childbirth), and niece, were murdered at Auschwitz. I knew this growing up, but it was not framed this way. My grandmother referred to these facts as “that Nazi business.” My parents discussed the Holocaust, but never as a personal, family matter, even though those murdered relatives were my mother’s uncle and aunt and cousin. My mother’s home was indisputably in America. For her mother, my grandmother, the same. For my grandfather, less so. He died when I was four, so my memories of him are hazy. He is reported to have had a heavy German accent, and to have never quite acclimated to certain seminal American realities—driving a car, for example—and being married to the fiercely independent woman who was my grandmother. After an intense six days, in which we understood we had not scratched Berlin’s surface, my daughters continued their travels and I returned to Washington, DC. I rode home from the Baltimore airport with a Pakistani cabbie. Initially, I didn’t know he was Pakistani, but somehow the conversation turned in that direction. Adamant on the importance of being multi-lingual, he reminisced fondly about his boyhood. His family spoke Punjabi at home; he spoke Urdu at school. He and his brothers enjoyed switching to Punjabi in the schoolyard to impress their mates. He learned Arabic by studying the Qur’an and was insisting his two young daughters—now thoroughly American—do so as well. Hindi and Urdu speakers understand each other, he said, but can’t read each other’s languages. Urdu, he noted, is read right to left in Arabic characters. His English was nuanced and flawless. His name was Asif and he left me with this morsel of wisdom, uttered in wistful reverence: Urdu is the language of poetry. Nothing surpasses it for the way it captures poetry’s music. In the first three months of the Trump administration, arrests of immigrants were up 38%. That works out to a rate of more than 400 people per day. The New York Times reported that many of these arrests were carried out in people’s homes. 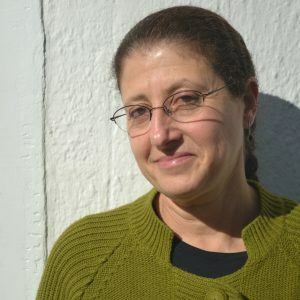 Martha Anne Toll’s nonfiction has appeared in the NPR, The Millions, Heck, [PANK], The Nervous Breakdown, Tin House blog, Bloom, Narrative, and the Washington Independent Review of Books; her fiction in Slush Pile Magazine, Vol.1 Brooklyn, Yale’s Letters Journal, Poetica E Magazine, Referential Magazine, Inkapture Magazine, and Wild. Her novel in process, represented by the Einstein Literary Agency, was shortlisted for the 2016 Mary Rinehart Roberts fiction prize. She directs a social-justice foundation focused on preventing and ending homelessness and abolishing the death penalty. Please visit her at marthaannetoll.com and tweet to her at @marthaannetoll.